Wet Steps heavy-duty aluminum dock ladders are designed to make climbing in and out of the water easier. Built with a 55 degree climb angle, this makes it just like a standard stairway (Climb Angle is 55 degrees - measured from a 90 degree vertical drop). All-welded construction with bolt-on steps. Built from high-quality marine grade aluminum with a u-channel frame. These ladders are built solid with a 500 lb. weight capacity. 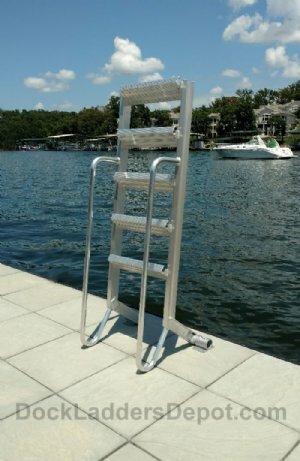 Ladders are light weight and easy to deploy by rotating the ladder 180 degrees in to the water or out of the water. Steps are custom extruded and grooved for extra strength and grip. The ladders have handles on both sides for extra stability when climbing in or out. Also available with Powder Coat Option for additional $150 fee (1-2 week lead time for powder coat option). 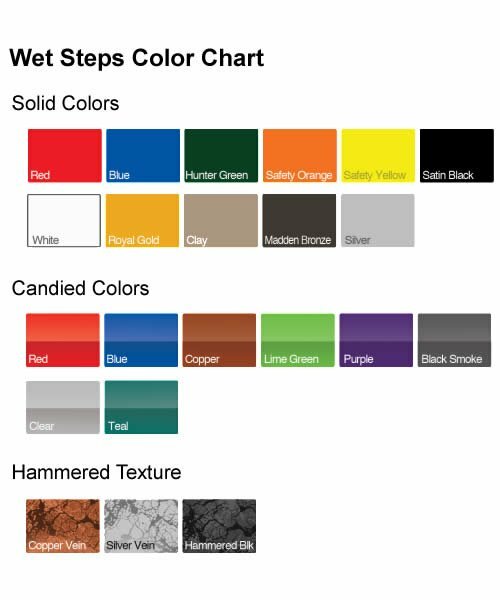 Choose from CLEAR COAT, RED, BLUE, HUNTER GREEN, SAFETY YELLOW, SAFETY ORANGE, SATIN BLACK, WHITE, ROYAL GOLD, CLAY (TAN), MADDEN BRONZE, SILVER, CANDY RED, CANDY BLUE, CANDY COPPER, CANDY LIME GREEN, CANDY PURPLE, CANDY BLACK SMOKE, CANDY TEAL, HAMMERED COPPER VEIN, HAMMERED SILVER VEIN, HAMMERED BLACK. Vertical Drop (from mounting point to end of ladder, in the water): 52"
Comments: Should've done this year's ago. Makes it so easy to get out of the water. As you get older this is more and more useful. Quality is excellent. Installation is simple and easy. Comments: Only a few weeks in but they're wonderful steps. Just wish I'd gotten the 7 step version to make water exit even more gradual. Comments: I bought the wet step five step dock ladder. Excellent quality; easy to install. Easy to get out of the water and solves a slippy step problem I had. I would buy from this company again.